-Easy to maneuver, once you get the hang of it. -It blends things a little more smoothly around the jawline than a traditional cosmetic sponge or foundation brush. -It eats a lot of make-up. Typically, a bottle of foundation lasts me anywhere from 6-8 months, if not more. The sponge soaks up quite a bit more make-up than a regular foundation applying tool. *Update: A couple folks suggested wetting the sponge to prevent some of the foundation from being "eaten". I did try that trick when I first purchased the sponge, but for me at least, it didn't work and kind of made my foundation a little thin. It might work for some of y'all though, so give it a shot! 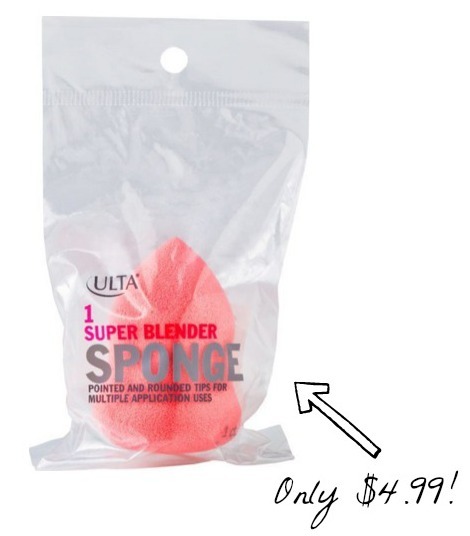 Behold, the Ulta Super Blender Sponge tutorial. You can purchase the additional products I mention at the following links: Primed and Poreless powder and the Nars blush in Angelika. *This is not a sponsored post. I purchased the sponge at an Ulta location near my home and all opinions expressed are my own. No compensation was provided by Ulta or other third party entities. View the products featured in this tutorial and others I love by clicking on the photos below! I tried those sponges and I am so allergic!! But I'm allergic to anything. Great tutorial though. Wish I could use those cursed beauty blenders they make your makeup look so flawless! Great tutorial. You answered all my questions and I can't wait to try the beauty sponge. I just might have to get rid of my foundation brush! Thanks for sharing your make up tips! To prevent a lot of the soaking up of the foundation is to use it damp. Wet it with warm water & wring it out an if you want a less dampness use a towel to dap it. I find it that when wet they're more fragile and start to break off & tear, so careful. Thanks so much for doing this tutorial, Leslie! It was super helpful! :) if you're feeling up to it, would you be interested in doing one for how you do your straight hair? I love your video for curling hair, and would love to see how you get your hair to stay straight and frizz-free in the southern humidity! Also, do you do anything in particular to keep your hair long and healthy? I've been growing mine out for years now and I can't seem to win the battle. Thanks for this! It was super helpful! Yes, do another vlog on the bend you do at the end of your hair... so cute! You're suppose to wet the sponge before you use it. That way it doesn't use up all of the product.